Buying New Cars is Financially Irresponsible. And I Just Bought a New Car. Wanna lose your street cred really quickly as a financial blogger? Buy a new car. Your loyal readers will shake their heads in disgust and call you a bunch of names that might or might not be deserved (It happened to my buddy Len) But on Friday, I made the plunge and have been smelling that new car smell all weekend. The aroma is quite pleasing. Honestly, I NEVER thought I would be the kind of fella to purchase a brand new vehicle. I mean, you saw my post about my Nissan Altima with over 200k miles. It’s still going strong and has about 10k more than when I wrote that post. And besides that, I don’t even really care about cars. They mean very little to me. So why in the world did I purchase a new ride for our family? Ok. Here’s the scoop. First, lets start with why I don’t usually buy new cars. Almost always. You can’t get around this. They are a financial burden almost any way you slice it. Granted, reliability has come a long way. And gas mileage has gotten a lot better. But most people buy a brand new car for that sweet smell that I’ve been soaking in the last few days. And it’s bad for your wallet. New cars involve more than just the monthly payment. Your taxes usually go up. Your insurance almost definitely goes up. Financing can be expensive if you aren’t thinking about it. And the hidden killer – depreciation. The combination of new car expenses can be as lethal as Justin Bieber deciding to join forces with Creed. Ugh. I’m guessing they would have to change their band name to Nails on a Chalkboard. But I digress. The Nissan Leaf is the only car I can actually recommend for you to buy new. There are a few others that get into the ballpark of being a decent deal when purchased new, but the Leaf is the only one that actually makes total financial sense to cross the line and jump into new car ownership. Prices have gone way down. Nissan dropped the price of the Leaf’s (Leaves?) $6k on the 2013 models. That’s a gigantic difference! My walk out the door price on my new set of wheels was $27k. That includes tax, tag, title, and all those other pesky things they tack on. That took some shrewd negotiating, and I’ll tackle that in a post really soon. Tax credits pay for half the cost. The federal government is still offering a $7,500 tax credit to people that purchase all-electric vehicles. Many states are offering incentives on top of that. Check out the full list here. I’m very fortunate to live in a state that is offering the most generous rebate. A full $5,000. So yes, the combined tax credits pay for almost half of my Nissan Leaf. I agree. That’s insane. If you live in GA and it fits into your lifestyle you almost have to hate your finances to not get a Leaf – unless you drive way too much or not at all. You can save big money on gas. First, let me say, Americans are too obsessed with gas prices. Most of us fill up two or three times a month and it doesn’t severely impact the costs of car ownership. That’s why upgrading to a new car that gets 10 more MPG doesn’t really make financial sense. BUT, what if you upgraded to a vehicle that didn’t use gas at all!? Well, that might make a bit more sense. I’ve estimated that we’ll be saving roughly $150-160 a month in gas consumption. And our electric bill should increase roughly $10. That’s a lot of savings. Maintenance is nearly non-existent. I don’t want to tell you how much I spent on repairs for our family vehicle in the last year. It’s a bit maddening to think about actually. And all that time at the mechanic shop. Eesh. With the Nissan Leaf, there’s no more oil changes, no more radiators to get leaky, no more belts to snap, and no more spark plugs that need changing…I could go on. Literally, the only maintenance required is rotating your tires and changing the brake fluid. I’m very excited about this part. 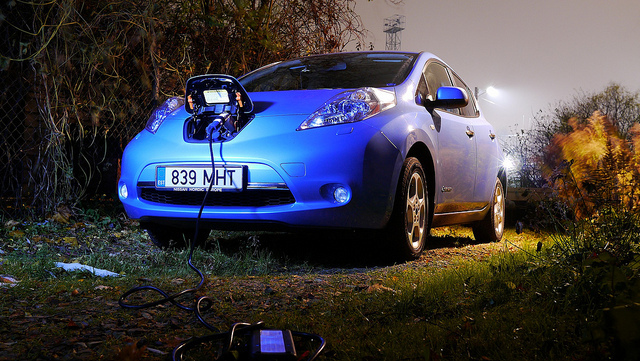 Is Nissan Leaf Ownership Right For You? That’s a good question. First, what state do you live in? The tax credits pushed me over the edge. If I lived in a state with a much less generous or non existent rebate I really might have held off. How much do you drive? If you drive between 20 and 70 miles a day you are probably a great candidate for the Leaf. If you drive more you might run out of battery power (unless you can conveniently plug in during your day) and if you drive less you might not derive enough savings to make it worthwhile. Pulling out a calculator and doing some dreaded math equations might be in order. For me, the math works out swimmingly. And when you consider the mental health benefits of driving a new car with almost no maintenance needs to speak of, I might even become a jollier fellow because of entering into Leaf ownership. I didn’t think that was even possible! By the way, I’m not installing one of those fancy charging stations at my house. I’m not sure how long we’ll be here and I’m pretty sure the trickle charging will work just fine for me. Especially since I can trickle charge at work too. Plus, charging stations are literally popping up in Atlanta every day. And, there’s this really awesome App/Website to find available charging stations in your area. And yes, technology is moving fast in this area. That is one of the downsides to purchasing an EV while they’re still in their infancy. But because this car will work for our family’s lifestyle in the long term it was a good decision for us. If you wait for a car with a 400-mile range those sweet tax rebates just won’t be there anymore. I promise I don’t go around buying new cars every day. In fact, I almost loathe the idea of buying new. It was almost surreal walking into a dealership. Especially since I never thought that would happen. However, in this case, a new vehicle purchase is actually the financially smart move. I still can’t believe I’m saying that. Since we’re talking about electric vehicles, I also wanted to mention that I have a mega obsession with my electric bike. I wrote a post about why electric bikes are so great on my new site that you should totally check out. How Does Obamacare Affect Me? There’s a Calculator for That! How Much Should You Have in a Rainy Day Fund? I’ve been thinking about getting a Leaf for a long time. However, I just moved into an apartment complex, so I don’t know how I would charge it overnight. Do you have any thoughts on owning a Leaf if you live in an apartment? Hey! You’ve gotta factor in a few things. One, can you charge at work? Two, what’s your commute distance? Three, how much extracurricular driving do you do? And fourth, do you feel comfortable asking your apartment complex if there is a place that you can trickle charge overnight? If you’re only 10 to 15 miles from work and can charge there, you’ll easily have a full charge by the time you leave. I would also check out Plugshare.com to get an idea of the charging station situation around you. If there are some easily accessible quick charge stations in your area that might be the tipping point. It might be worth mentioning that the tax incentives only are good if you have a high enough income/tax liability. I guess this is on a State by State basis, but to take advantage of the full tax incentive in GA, I think you would have to have a family income around the neighborhood of 65k. As a full time student, and with a spouse that is a teacher, it just doesn’t make sense. But man would I ever love to have an all-electric car. Just think of all the Costco hotdogs I could buy! Good point Wiley. Every state has their own set of rules though, which is why I just linked to a page that details those rules. In GA, the state with the best rebate, you would have to make roughly that income. Very true. Costco hotdogs rock! Hey Joel, great post and great info! 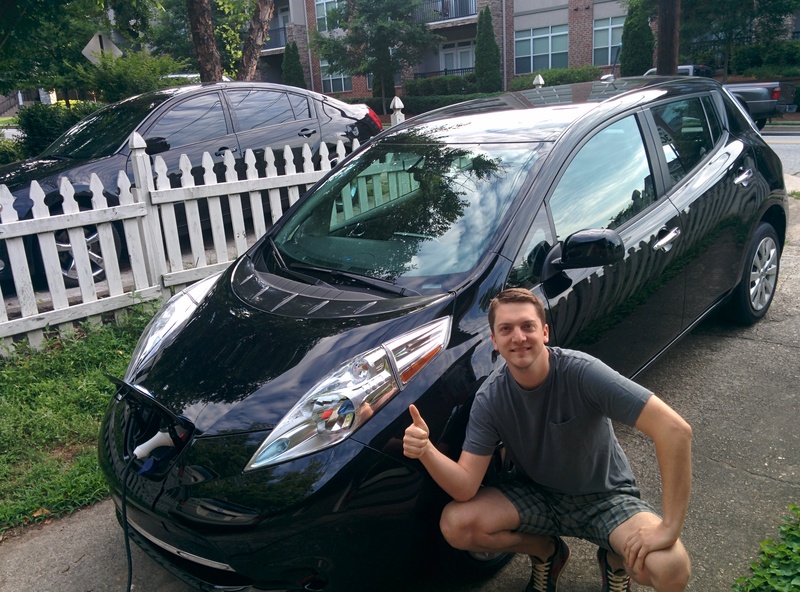 I really can’t wait to hear more about your experience with the Leaf as time goes on – one of my friends has a Leaf, and he is obsessed with it! Until, you know, they make an affordable Tesla. Then, adios Prius! Thanks Melissa! Prius’ rock! Glad you are enjoying yours. Here’s hoping your battery keeps on truckin’. And I do hate how different states have different rebates. It’s not totally fair. And I still don’t understand how GA became the state with the highest rebate. I too am waiting for the affordable Tesla though! Do those tax incentives apply if you buy a used Leaf? Not sure that there are too many on the market since they debuted in 2010, but in theory we are about to hit the point where there should be more. Hey Dave. They don’t. You gotta buy it new. That’s why the used Leaf market is super weird right now. Especially in my state, no-one wants to buy a used Leaf. It’s cheaper to buy it new. Interesting points, though I’ve already promised my husband that, if at all possible, the next car we get will be a Challenger. So I think I’m out of luck on that account. Personally, I think people generalize too much about new cars. First of all, you know you have some time before repairs become a thing. My husband and I bought a four-year-old car and within a year had put over $1,000 in repairs. The next year, it was something like $2,500 because the A/C unit fried. (We’re in AZ, so not really optional here.) With a new car, there’s peace of mind and a far clearer view of what you’ll pay for the car for the first 2-3 years. That’s pretty important to a lot of people, myself included. Also, depreciation really only matters if you a) plan to sell the car or b) get in an accident. If you’re going to keep the car until it’s dead, who cares what it’s worth? Good point Abigail. I agree, if you’re gonna keep a car for 10 years or longer, it’s ok to purchase new. Glad you got a great deal Gina! Thanks for sharing! I hope you enjoy your new electric car. Did you trade in one of your other cars or do you now have three now? Also, I see you took the picture with a Nexus 5. How are you liking that and what cell phone provider are you on? We’re going to be selling our Outback. Gotta keep the ol’ reliable Nissan! I am digging the Nexus 5. It’s a really great phone. I’m on the Sprint family plan with 5 folks. Unlimited everything for under $50 a month. You didn’t factor in battery replacement at $5500 every 5 years. That’s the warranty; 8 years for materials or workmanship defects, but only 5 years for capacity loss. That should be the worst case scenario, and battery technology and pricing should improve in future, but battery replacement will be required, if you plan to keep the vehicle long-term. Lloyd, I definitely don’t think I’ll be replacing the battery every 5 years. There are a lot of people that have driven their Leaf for over 100k miles with no battery issues. Even if a bar or two of capacity is lost in the next 5-6 years that doesn’t necessitate replacement. I just won’t be able to get quite as far on a charge! I promise I’ll be posting on that soon. I’ve got some great tactics for walking out the door with the best price in hand. Great, would be much appreciated=) I just went to take a look at one today, but the ‘best’ offer they would give me was closer to 30k. I’m about to pull the trigger – but if I could save 3 grand that would be awesome! Joel, your reasoning sounds quite logical to me – I think you made a terrific purchase! Once we’re out of debt, we’d definitely jump on a deal like this. Joel, Can the $7500 Federal Tax Rebate be spread out over multiple years if I don’t have a salary high enough to get the whole amount back in 1 tax year? Unfortunately not Ed. I really hate that. Bad move on the part of our Congress. I have multiple friends/co-workers who have leased their Leafs on a 2 year lease. Did you look into that option at all? If so, why did you decide to purchase over lease? From what they were saying, after the tax breaks (both state and federal) it almost comes out to getting a free car for 2 years (not including the power). Hey Adam, I did look into that. MOST people are leasing right now. And that’s another great option. For me, purchasing made a bit more sense. That’s because, in 2 years, these tax incentives will no longer be around. I wanted a big discount on my EV and I didn’t want to be in the position to have to pay full price for a new one in 2 years. Even with advances in technology, this car will work with our lifestyle for the next 10 years. I think if the current model will function will for your lifestyle long term then purchasing is the right decision. Hi! I noticed you have a young daughter. We also have a 2 year old and are thinking of trading in our Murano SUV for a leaf. How does it do for storage? Can you put strollers, beach chairs, suitcases etc in the trunk? How does the carseat fit in the back – is it a roomy car? While the Murano appears larger – its capacity isn’t much bigger than the leaf according to Nissan’s website. Thanks!! Its funny when people suggest that people buying new cars are interested in other people’s opinions and impressing them with a new car. i dont think anyone in my town is particularly impressed by my new subaru forester. you cant let your frugality turn you into a nutball. There are perfectly legitimate reasons for someone to want a new car. there are also perfectly legitimate reasons for people to buy a higher performance car for the additional enjoyment they get out of it. not everyone wants to pinch every penny in every aspect of life (the OP probably has something he enjoys and waste some money on also). Never sell the car you like unless there is a extremely emergency, many people first suggestion is to get rid off the car but not getting your money back is pointless selling the car. If you can paid off the car and purchase an honda as your basic daily drive vehicle that will be essential if you can not continue making payments that is another story. If you do not make payments on the car try to conserve because you not having another sport car probably in this life time.